Somehow I managed to miss this challenge. 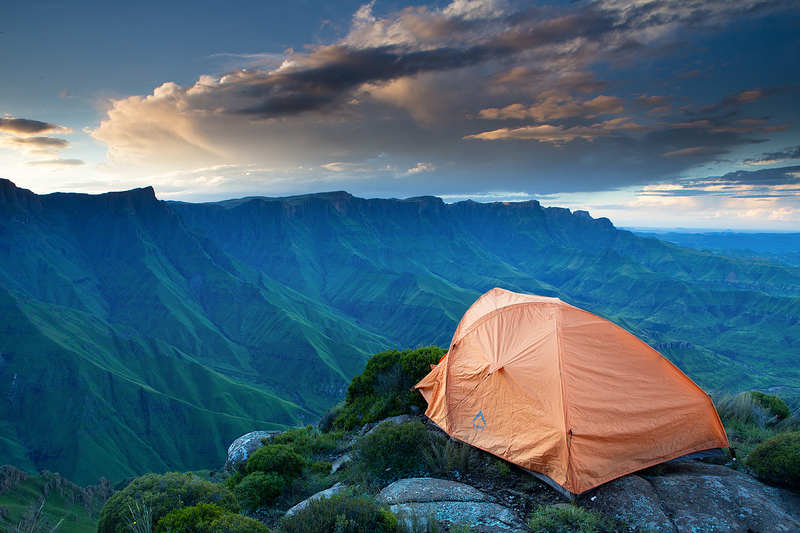 The scenery is spectacular and the tent placement is an ingenious idea. It really makes the image special. Well done Rian. I'll never tire of seeing your shots from the Berg. Keep em coming please. Good grief - how did I nearly miss this slipping off the front page? Great shot Rian - I know it was done in haste so you did a good job to set it up and still get a super shot of it before the light went. This shot actually doesn't even do it justice as to what a precarious position this tent is set up in: (unedited) but it sure is a magnificent view! I was sure you would have gone with a Mponjwane sunrise shot but this is still a great one! Thanks for joining us on the hike - had loads of fun and can't wait to head back to the cutback for some seldom seen angles. Message edited by author 2015-02-11 06:38:46. Wow what a spot, congratulations on your HM. I thought this might be yours...good job!!! Congratulations Rian..so good to see you !!! Stunning place, stunning photo. I'm glad you didn't sleep in that spot. There could be dire consequences if you 'had to get up in the night'. Great to see you near the top Rian. As usual stunning image and amazing place! Lovely vista. Well captured. Not sure the tent really adds to the image. Perhaps if it was smaller in the frame and served as a supporting element, rather than such a main subject. Is there even a flat spot under that to sleep in? Perhaps you set the tent up here just for this shot? It was an excellent idea. I should take up hiking. Those colors are beautiful! love the comp and balance is nice. What a place to camp. Nice shot. Proudly hosted by Sargasso Networks. Current Server Time: 04/18/2019 08:41:37 PM EDT.